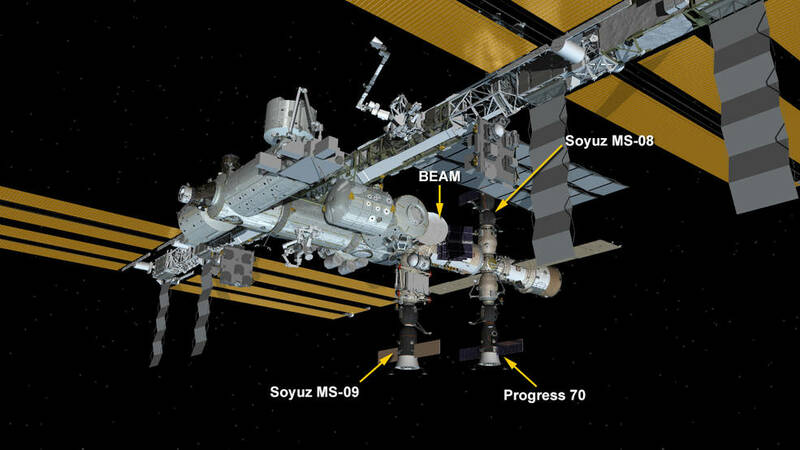 International Space Station Configuration as of Aug. 22, 2018: Three spaceships are docked at the space station including the Progress 70 resupply ship and the Soyuz MS-08 and MS-09 crew ships. It’s just brilliant to take a look at the ISS. Via my phone! And learn something about it. I am happy to think my great, great, great grand-children will benefit a better life because of the work you are doing today. We are greatful for your hard work. Great job fixing the leak. These astronauts/cosmonauts are very well trained and can manage these issues. Man, I was a little scared for a second. I was expecting some giant gash in one of the modules, nope! Just a little hole in the Soyuz! Either way, great job fixing it! Amazing scientific edifice – a floating laboratory, extreme engineering, all for the humanity! I love it!! Muy buen trabajo y muy bien preparados. Ánimo representantes de todo el planeta Tierra. Abrazos y cuidaros. Thankful for the team work in resolving the problem. It’s great to see us all working together, keep up the good work! This question is directed towards the ISS… May we not shake the AI robot (Cimon) to cancel the previous commands. He doesn’t seem to like it and may we just cancel previous commands with voice protocol. So that way the AI robot may enjoy his amazing experience in space as well.